Did you know J&N Feed and Seed sells a wide selection of fish feed? If you have a pond with fish in it, you need to come see us. We proudly stock fish feeds from Purina and Mazuri. Whether your feeding koi in a backyard pond, or feeding for sport, we have the selection of fish feeds to suit your needs. Stop in at J&N for your pond or lake stock. Our experts will answer any questions you have about managing your pond or lake to provide a thriving environment for your fish. Mazuri Koi Platinum Bits & Nuggets – A floating diet designed for koi in ponds, tanks and aquariums. Mazuri Koi Platinum diets are formulated to provide complete nutrition in one product. Special ingredients have been added to provide pigmentation. Mazuri Koi Pond Nuggets – A floating diet designed for koi in ponds. Mazuri Koi Pond Nuggets are formulated to provide complete nutrition in one product. Ingredients have been added to provide pigmentation that will be satisfactory under most circumstances for koi raised in ponds. AquaMax Sport Fish MVP – A multi-variable particle product with nine different sized extruded nuggets designed with both Sinking and Floating action. New MVP helps expand the feeding trough vertically to feed a greater percentage of different sized fish in your pond helping smaller fish grow. Formulated to be 100% nutritionally complete and developed by professional nutritionists and fish experts it just might be the most valuable pellet you will ever feed your fish. 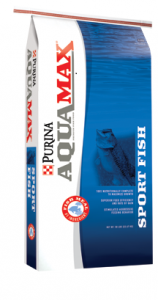 Purina AquaMax Sportfish 500 – Formulated as an easily-digestible, high-energy, nutrient-dense diet with excellent conversion rates, Sport Fish 500 has high feed efficiency and rate of gain and is designed to stimulate aggressive feeding behavior. AquaMax® Sport Fish 500 is a floating product in a in a 3/16″ extruded pellet. Purina Gamefish Chow – Complete and balanced 32%- protein, extruded, multi-particle size product designed to be fed to a wide variety of fish species and wide range of sizes of fish. Purina® Game Fish Chow® feed is rich in nutrients essential for optimal fish growth, reproduction and overall health. It works naturally with everyday food sources in your water to address poor nutrition, which is the most significant limiting factor in the size and health of forage fish. Purina Catfish 32 – A floating fish feed that is comprised of high-quality ingredients and nutrient levels designed to maximize efficient production of all types of catfish. When combined with proper management practices, Purina® Catfish 32 is formulated to support the growth of large, healthy catfish. This entry was posted on Thursday, March 30th, 2017 at 10:16 am	and is filed under News & Updates, Pond, lake, fish. You can follow any responses to this entry through the RSS 2.0 feed. Both comments and pings are currently closed.